Sorry guys, noob question here. I'm going to get my suspension set up by a lock guy near me in Leeds. With all the fancy modes and DDC, what should I be set in before he adjusted the suspension. I.e soft, normal or hard and rain, road, dynamic or dynamic pro. Also, I understand that when you set the sag, the ignition must be left on? Is this correct and why? Pages 68 onwards in the owners handbook tell you what you need to do. On a DDC bike, you can only set up the preload. 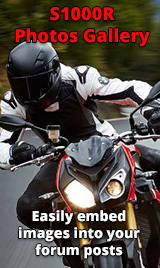 It only states that it should be in soft mode for pillion riding. I presume that it should be in normal mode for a single rider? The DDC should be set to soft and to one-up riding (single helmet shown in the display screen). Apologies, I did read that wrong. Looking forward to getting it set up right. It feels far too hard on the front end and not at all confidence inspiring. I think i'm about 80kg without gear but the lad I bought it off was a bigger frame than me. Finger crossed that it will all be sorted tomorrow. Other than that, it's a great bike and a lot of fun. Just need some confidence inspiring suspension on the front. Feels like it could bounce and let go at anything passed medium pace. I am also struggling with the hard suspension, I'm only around 75kg with gear so bike feels supper hard even on rain mode! Anyone know of people to help with suspension setup around London/ Surrey area. I have a 2017 sport model and they are apparently firmer ride than the older bikes which also had more ddc options. You really don’t need to spend money on a suspension set up for the R as you can only adjust preload. You just need to be able to use a tape measure, subtract one number from another and use a spanner to turn an adjuster. A mate / wife / girlfriend who can help take the measurements will make it easier.